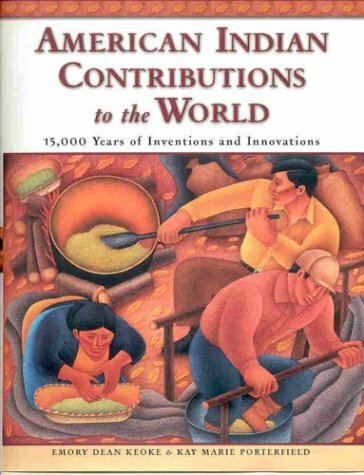 This Encyclopedia of American Indian Contributions to the World is a fascinating reference work. Listing inventions, innovations, ideas and policies, the book offers a glimpse into the past that most of us will be completely ignorant of. The writing is neutral, objective, accessible. The information is credible. But what makes the book outstanding is, ultimately, the wealth of information and the subject matter. For a layperson, almost everything in its pages will come as a surprise. After all, we're mostly used to Indians being shown as half naked hunter gatherers in pop culture, or as noble savage shamans in touch with nature. Perhaps we read about Aztec gods and human sacrifices, but who knew that the Aztecs were centuries ahead of their time in their dentistry practices, that they invented toothbrushes and practiced preventative care to avoid cavities? Everyone knows about tomahawks and totem poles, but, outside America, who realises that the US constitution and the system of federal government instituted by the founding fathers in the Constitution was heavily inspired by the Iroqois confederacy? (Probably, even in America, it might not be a universally known fact). Sterile surgery, freeze-dried food, fertilisers, almanacs, ... the list of inventions is surprising and delightful. Of course, the book cannot be a complete work. The destruction of Indian cultures was so complete that many things were never really documented. Entire tribes, languages and ways of life were wiped out. Prior to that, civilisations rose and collapsed without necessarily passing on knowledge. I've heard it said by better educated people than myself that the Roman Empire was not all that far off from reaching an industrial revolution: various inventions existed sprinkled throughout the empire that, had they caught on and had information sharing been better, could have changed history in ways we can barely imagine. Yet, until the Enlightenment and the printing press, information travelled slowly - too slowly for the Romans to industrialise. And, clearly, throughout the Americas it travelled too slowly for any one culture to pull together all the various ideas, innovations and inventions. So we are left with a glimpse that only reveals a tiny fraction of the innovations that Indians had come up with. Many of my questions about everyday life were, inevitably, not answered by the book, perhaps because many of the details are simply not known, or perhaps because two authors can only collate so much information, can only fit a certain amount into one (sizeable!) volume. Regardless of the limitations, this encyclopedia is a stunning achievement, and anyone interested in pre-conquest American cultures should have a copy on their shelf.